If you’re new to our blog, you’re probably not familiar with a phrase we use often, “Boss Your Heart”. Click HERE to read why this phrase is so important to us. In short, our Princess Chrissie, who now lives with Jesus, is the inspiration behind this phrase. God enabled Chrissie to “boss her heart” into beating and pumping on its own when it shouldn’t have been able to. You can read about that horribly frightening yet beautifully miraculous day HERE. After Chrissie went to live with Jesus, countless people suggested we created a ministry to carry out Chrissie’s “Boss Your Heart” legacy. 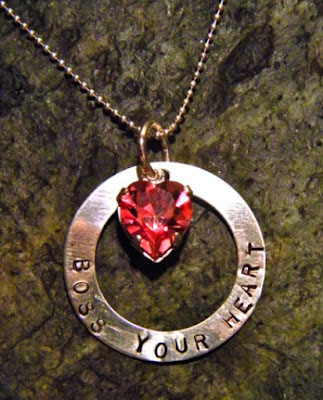 Countless people shared with us what the phrase “boss your heart” meant to them in a spiritual way (which you can read about in our Boss Your Heart book). A precious woman of God even created a “Boss Your Heart” necklace in memory of Chrissie. So, the phrase “boss your heart” has special meaning to our family, as well as to many people around the world who have been touched by Chrissie’s story and legacy. Up until this weekend, I had never heard anyone talk about bossing their hearts without referencing Chrissie. Well, this weekend, two women posted on my Facebook wall that they had read a devotional that referenced bossing their hearts. I was stunned to find that someone else had written about bossing hearts! Click HERE to read a devotional entitle “Sometimes I Have to Boss My Heart Around”, written by Renee Swope, published on the Proverbs 31 Ministries site. I read this devotional yesterday, and it almost felt surreal to read someone else’s devotional that talked about the very thing we preach daily, using the very phrase our daughter coined—“boss your heart”. WOW! God used this devotional as a reminder to me to boss my heart that morning, as it seemed I had woken with an ungrateful attitude, full of grumbling and griping just because I was tired. The devo set me straight, and I bossed my heart back into submission to God’s Word. I love when God does stuff like this—uses our very own phrase in someone else’s devo to remind me to boss my heart back into submission. Praise Him! Perhaps your heart needs some bossing today—mine always does! So grateful for the legacy of our princess, reminding me daily to be the boss of my heart, not allowing it to be deceived by the world and Satan’s lies, but to be submissive to God’s Word, living in Truth. Don’t let your situation, circumstances, and/or emotions to boss your heart. Let God’s Word be the boss of your heart and experience the joy and freedom we have through Jesus Christ.